The South China Karst (simplified Chinese: 中国南方喀斯特; traditional Chinese: 中國南方喀斯特; pinyin: Zhōngguó Nánfāng Kāsītè), a UNESCO World Heritage Site since June 2007, spans the provinces of Chongqing, Guangxi, Guizhou, and Yunnan. It is noted for its karst features and landscapes as well as rich biodiversity. 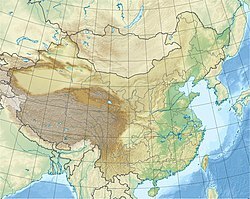 The site comprises seven clusters Phase I: Libo Karst, Shilin Karst, and Wulong Karst inscribed in 2007, and Phase II: Guilin Karst, Shibing Karst, Jinfoshan Karst, and Huanjiang Karst inscribed in 2014. UNESCO describes the South China Karst as "unrivalled in terms of the diversity of its karst features and landscapes." Karst limestone stalactites in the Furong Cave. Tianlong Bridge, a South China Karst natural arch. ^ a b "Twenty-two new sites inscribed on UNESCO's World Heritage List, and one deleted during Committee meeting in Christchurch". UNESCO World Heritage Convention. 29 June 2007. Retrieved 2011-02-14. ^ "South China Karst". UNESCO.